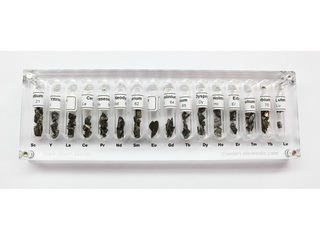 Complete Acrylic Rare Earth Set incl. modern Acrylic case- New design! We are proud to offer the new and re-designed Rare Earth Set totally in acrylic design. Plain and functional with cool design which puts the valuable exhibits in perspective. The cover is mounted by four neodymium magnets, so that the it can be easily removed. 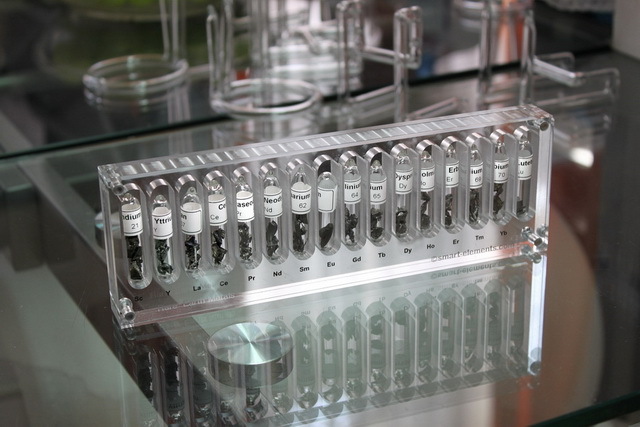 All Rare Earth Metals (Lanthanum, Cerium, Praseodymium, Neodymium, Samarium, Europium, Gadolinium, Terbium, Dysprosium, Holmium, Erbium, Thulium, Ytterbium, Lutetium, Scandium und Yttrium) sealed in our lab in attraktive 11mm wide ampoules under high purity 99.999% Argon. Size Ampoules: 10-11mm Diameter, 45 – 48mm long.